I want my Summa … I want my fun … I want my SUMMADAYZE!!! It's the start to YOUR New Year and what better way to start it than with Australia's most iconic summer festival. Having reached cult like status, each year it takes the nation by storm. So get set as Summadayze returns with a kaleidoscope of sounds in January 2013, armed with an inspired lineup jam packed with enough block rocking beats to leave you in a spin! Once again, Australia’s most intriguing and authentic Summa music festival will take to the most gloriously picturesque settings across the country for what will undoubtedly be another unforgettable New Years experience! 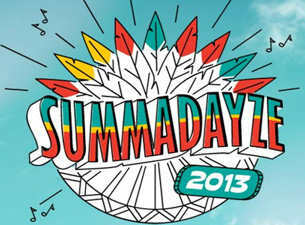 For more than a decade, Summadayze has ruled supreme as Australia’s most iconic Summer celebration - and it’s easy to see why. Year after year Summadayze has bought you the biggest and best international live acts of our time, whilst also introducing Australian audiences to an inspired selection of the most talked about new artists from around the world. Who can argue with Snoop Dogg when he says…? So, don your brightest feathers, Aztec patterns and painted stripes. Follow the chant and get ready for the ultimate Summa celebration. Hold on tight, this year’s Summadayze festival is going to be one hell of a ride! Get ready as we prepare to raise the proverbial roof once more and send the festival stage into overdrive. Summadayze is back – the countdown is officially on! This year, Future Entertainment has enlisted the help of pop culture visionary Mark, ‘The Cobrasnake’ Hunter to curate the creative concept of the Summadayze festivals. Check out our teaser video below. Check out this year’s line-up below. BOOK NOW, PAY LATER OPTION IS BACK!